The Light Fantastic is a folding transport chair that weighs only 18 lbs. And it folds and fits into its own Carry Bag as well. Take your loved one to the mall, a movie, out to visit friends. 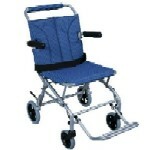 Just having this transport chair will get your loved one out and about again. These chairs are amazingly handy when you have an elderly, or disabled person who cannot walk for any distance. This isn't a "wheelchair" and the big benefit is that it doesn't get the negative reaction that is so common with wheelchairs. Being able to maintain your older person's dignity is the key. If this chair provides transport without the negative connotation of a wheelchair it will solve one problem and assist with the need to maintain a person's dignity and get that individual out in the world again. The aluminum frame is lightweight and strong. 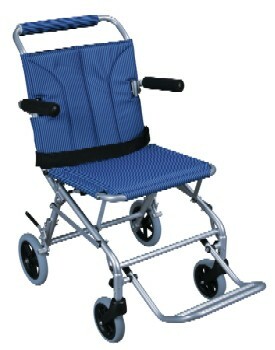 The transport chair folds just like the very common aluminum garden folding chair. After folding up when not in use you will be able to stow it in your trunk or closet within its own Carry Bag. The wheels are constructed of a composite material to be lightweight and maintenance free. 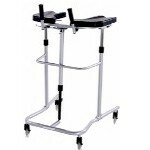 The chair has a fold down footrest and that can be folded "out of the way" when sitting or rising from the chair; those footrests are always in the way on wheelchairs! The armrests are padded for comfort and even they can be flipped back and out of the way when not desired. The rear wheels come with standard wheel locks. ! The chair seat and back are made from a lightweight, nylon upholstery. Not only is it light, it will be easy to clean as well; just sponge it off. Roho AirLITE Wheelchair cushion combines the benefits of a sealed air support pad and durable, high density contoured foam to provide extended durability and optimal support. Save your back! 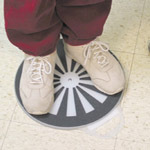 The SafetySure™ Pivot Disc will give Caregivers major assistance transferring an individual from one place to another, i.e. from their bed to a wheelchair, or from their wheelchair to the commode.